Based on our initial impressions of the website, Lunarpages appeared to be a knowledgeable and dependable firm offering easy-to-use, low-cost shared hosting plans and a good candidate to rank well at NCM Online. Unfortunately, we could not have been more wrong. The sign-up process is tedious and time consuming. 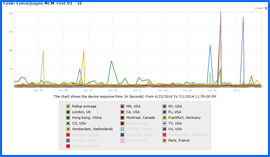 Testing showed that while the server managed to maintain 100% uptime there were DNS issues. 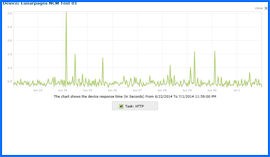 These problems negatively impacted page load speeds — resulting in some of the slowest recorded to date. Complete details below. In summary, Lunarpages has earned the NCM Online designation of NOT RECOMMENDED. 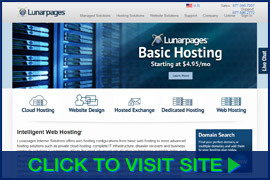 The Lunarpages website offers a number of low-cost shared hosting plans. The cheapest of these, Starter Web Hosting, is priced at only $3.95 per month. Clicking on the homepage special offer banner leads to a plan comparison page with brief descriptions of four shared plans. However, the Starter plan cannot be found there. To locate it, use the ‘Hosting Solutions’ dropdown menu at the top of the page. The Starter plan is located beneath the Linux and Windows options of Basic plan. As is our practice, we selected the lowest-cost plan, Starter Web Hosting, for purposes of testing and review. The two-step Lunarpages checkout process is relatively fast and easy. The rest of the process however, is not quite as user friendly. In order to limit our exposure to credit card fraud, we use PayPal for online purchases whenever possible. This was the first time that we had ever been informed that processing such a payment could require “several days.” Perhaps Lunarpages communicates with PayPal via carrier pigeon. 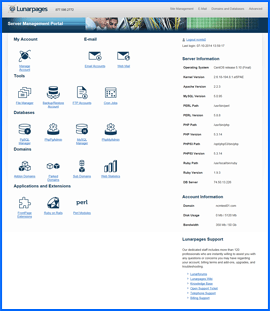 Screenshot of Lunarpages Server Management Portal. Click to enlarge. While have had experiences with hosts that call to confirm the account holder’s identity, the process does not generally delay receipt of the hosting set-up information. The was the first time we have been asked to produce photo ID. We faxed it over. Approximately 11 hours later we received the “Critical Account Information” e-mail. It did include everything required to set up our test site —. Lunarpages shared accounts utilize the proprietary “Lunarpanel” control panel (screenshot right). As we would soon learn, it is not quite as user-friendly as cPanel or vDeck. When it came time to install WordPress, we expected to find some type of script installer icon or link within the Lunarpanel “Applications and Extensions” section. There was none. We next checked the “Databases” section, clicking on the icons and searching for some clue to as the whereabouts of the WordPress installer. There was none. We then repeated the process in the “Tools” section. No luck. We tried the “Manage Account” link. This only succeeded in logging us out of the control panel. Fresh out of ideas, we headed to the helpdesk and submitted our second ticket. 1.5 hours later we received our response. The link for the Softaculous applications installer was located above the control panel banner and opposite the Lunarpages logo within the “Site Management” drop-down menu. We were ready to choose a new line of work. Lunarpages Uptime Test Results Chart. Click to enlarge. Utilizing the services of Dotcom Monitor, all web hosting services reviewed by NCM Online are subjected to 10-day uptime and page-load speed testing. Beginning on 6/22/14 and concluding on 7/1/14, our Lunarpages-hosted website was checked for uptime and page-load speed every fifteen minutes. Approximately two thousand individual checks spread across thirteen locations worldwide were performed during the 10-day test period. Of the 977 server uptime checks performed, 975 were successful, while 2 failed. The failures were both DNS errors occurring on 6/24/14 — one was experienced by the Montreal test location, the other occurred in Virginia. However, and despite these errors that slowed response time, the connections were eventually made and Lunarpages concluded our reliability testing with a 100% uptime score (see uptime test results screenshot above right). Lunarpages Speed Test Results Chart. Click to enlarge. While we would prefer not to dwell on negatives, Lunarpages’ average page-load speeds were slowed by DNS errors occurring on 6/23, 6/24, 6/25, 6/30, and 7/1. These issues occurred at the Amsterdam, Frankfurt, Hong Kong, Montreal, Colorado, and New York test locations. Over the course of the 10-day test period, page load speed for our simple one-page test site averaged a decidedly slow 2.5752 seconds across 13 test locations worldwide (see screenshot right). The 7 U.S. test locations recorded a faster — but still slow — 10-day average of 1.6393 seconds for a browser to load our page. Despite the very-affordable pricing — ease-of-use and page-load-speed issues prevent us from endorsing Lunarpages at this time. Lunarpages has earned only 3 stars and is not recommended by NCM Online. Cheap website hosting company price comparisons based on 1-year term list price before coupon/promo codes or limited time/introductory offer discounts. These are the renewal rates for the second year of hosting. To ensure that you receive the most affordable Lunarpages pricing possible, please visit our Web Hosting Coupon Codes page for current discounts and special offers before making any purchases. Launched in 1998, Lunarpages Internet Solutions has become an enterprise-level information technology solutions company and worldwide webhosting provider. It has tailored accessible and innovative webhosting solutions to meet the needs of individuals, small businesses, and established industry leaders. Integrated hosting tools are created and managed by them to support all levels of webmasters in creating, designing, optimizing, and marketing their projects. Lunarpages is a top provider of IT, business process outsourcing, and IT infrastructure. They aim to limit risks, increase return on investment, and decrease time required for clients to realize their goals. The company’s efforts are focused on excellence and professionalism. The company strives to use green facilities as it upgrades to newer webhosting technology. The company boasts more than one hundred highly professional and award-winningly efficient staff members to serve and support the ever-increasing client base currently numbering 150,000. Even though they are one of the most secure and biggest hosts in the industry, they remain dedicated to maintaining close relationships with colleagues and clients. Lunarpages’ eight datacenters located in California, Arizona, and Nevada are all top-of-the-line, PCI compliant, and SSAE16 certified. They all have many-tier redundant power systems and are monitored around the clock by security and trained personnel. This ensures the servers will always run efficiently and smoothly to protect every client’s businesses and web presence. One of their datacenters in Hawthorn, CA is state-of-the-art offering a multi-tiered, fully reliable, controlled, and secure environment for their servers and equipment. Five other datacenters in Denver, CO, Ashburn, VA, Irvine, CA, and Chicago, IL are also top-of-the-line and SAS70 Type II accommodating. A certification of SAS70 Type II audit is an international standard that reviews technology service providers of all levels for business practices, communication, internal procedures, and security. These datacenters also have fully redundant power backed by diesel generators, multi-level security services, and diverse Internet access providers and paths. The Lunarpages datacenter in the business district of downtown Las Vegas, which was SAS70 Type II audited, is secured with key card access, around the clock monitoring, Mantraps, closed circuit TVs, and connections between the alarms and local fire and police departments There is additional fire monitoring and suppression, 2N UPS power supplied with back-up, cooling containing N+1 capabilities, and carrier neutrality that has many IP transit, as well as, transport carriers. It is operated at all hours of the day by accredited operational staff that complete data center build-outs, remote hand tickets, deliveries, and cross connections. Lunarpages’ AIS building in San Diego has Tier 4 certification with a collocation facility that is more than 80,000 square feet. It is protected with the most advanced technological security and has also has been certified with a SAS70 Type II audit. Call centers in Anaheim and Corona, CA are supplemented with satellite locations around the country. All these data centers enable the hosting service to offer industry-leading environment control features, increased capacity, and the scale to meet the growing business needs of their customers. This video tutorial demonstrates the installation of WordPress on a Lunarpages shared hosting account using the LunarPanel control panel and the Softaculous applications installer.